​When the sun is shining, it's always a great time to grab some food and some healthy drinks. 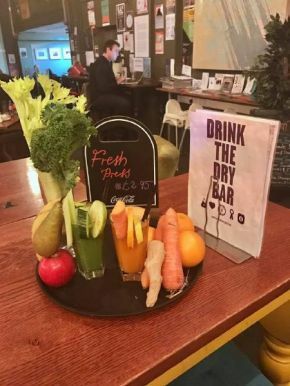 The Brink, a dry bar in Liverpool is a brilliant place to go, their juices and fresh presses are fantastic and a great way to get a portion of your 5 a day, bursting with vibrant flavours and at a healthy price, you'll be hard pressed (like the fruit) to find better drinks. On our recent visit to The Brink, me and a guest enjoyed The Brink Burger, a great hamburger with a really nice house slaw, a gorgeous pink colour to it, really compliments the burger so well, the house chips are really great too. Also tried on this outing was the Halloumi & Falafel Burger, again, fantastic burger, great alternative to meat, the flavours work really well together and it's surprisingly filling. In addition to the excellent juices and presses, there are a myriad of other drinks, the Brink Cocktails are a real treat, the Chocolate Cooler is definitely one to try, as is their Brink Panther which features strawberries, cranberry juice, Apple and elderflower cordial and much more. The Brink is a really great spot in Liverpool for food and drink, their events are brilliant too, health and well being events play a big part in their arsenal, highly recommended for feeling good! Their drinks menu is below, be sure to pop in soon!